At the invitation of the Government of Niue, SPC RRRT has been assisting with the development of legislative reforms in the area of family law. 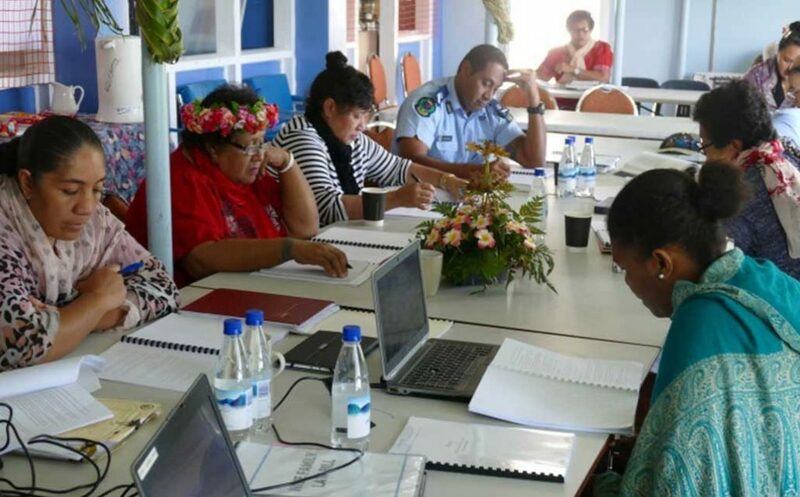 SPC RRRT’s assistance for the development of family protection legislation in Niue included supporting Madam Judge Mere Pulea, a former Fijian Family Court Judge, to provide technical assistance to the Government of Niue. Judge Pulea has worked with SPC RRRT on the development of family protection legislation in a number of Pacific countries. Under the leadership of Ms Gaylene Tasmania, the Director General of Social Services, stakeholders have been active in a series of consultations to deliberate, comment and provide feedback on what the legislation should contain. Key stakeholders who are working together include members of the Bills Committee and representatives from the Police, Department of Education, Department of Justice, Crown Law, Public Service Commission and Health and Social Services. Judge Pulea assisted with the development of the initial draft of the Family Law Bill for consideration by the stakeholder group. Going through this process and contextualising the draft Bill to the practical and lived realities of Niueans allowed for vigorous and robust discussions to unpack key issues to take into account when revising and updating the proposed legislation. The draft bill contains eight major parts and includes legislative provisions relating to marriage, de facto relationships, separation and divorce, access and custody issues relating to children, age of majority, child protection, domestic violence and other ancillary, but associated matters. SPC RRRT is continuing working with the Government of Niue through the Ministry of Social Services in developing a revised draft of the Family Law Bill that reflects the needs identified for Niue through the consultations, as well as socialising the ideas covered by the Bill to facilitate a smooth journey of the draft legislation through the law making process. This Story of Change was originally published in the Pacific Women Annual Progress Report 2015-2016. All values are consisted with that reporting period. For the most up-to-date value of activities, visit our interactive map. *This activity is part of a larger program.